For me, this was a “padding buy”. One of those sets you get that are relatively cheap, but is enough to get you over the line for free shipping. 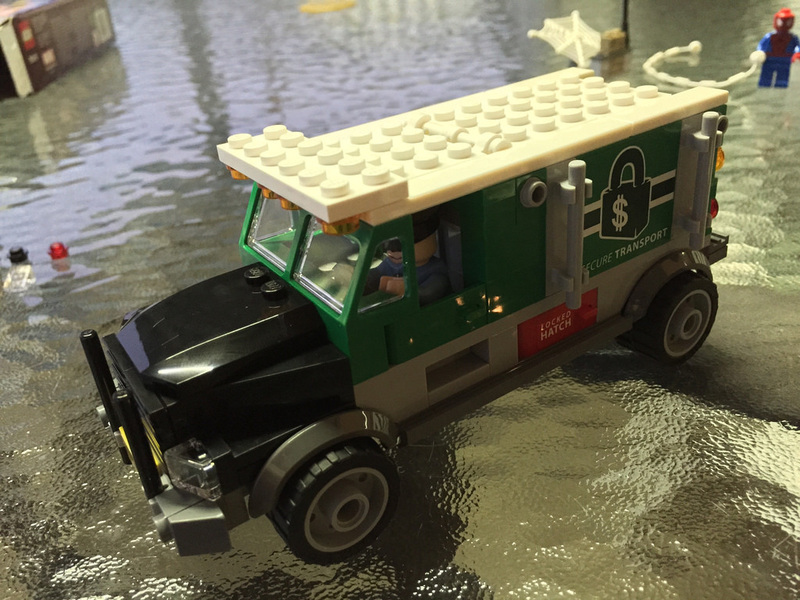 I didn’t have any superhero minifigures, and an armoured car would look great in any cityscape. Plus, the Doctor Octopus minifigure looked pretty interesting. Out of the box is 2 parts bags, an instruction booklet, small comic, and sticker sheet with 5 stickers. Of all the parts in this set, only one is unique (well, actually it’s two, but they go together). That’s the windscreen frame and windscreen of the armoured car. It’s actually quite a nice piece, and suits the vehicle very well. 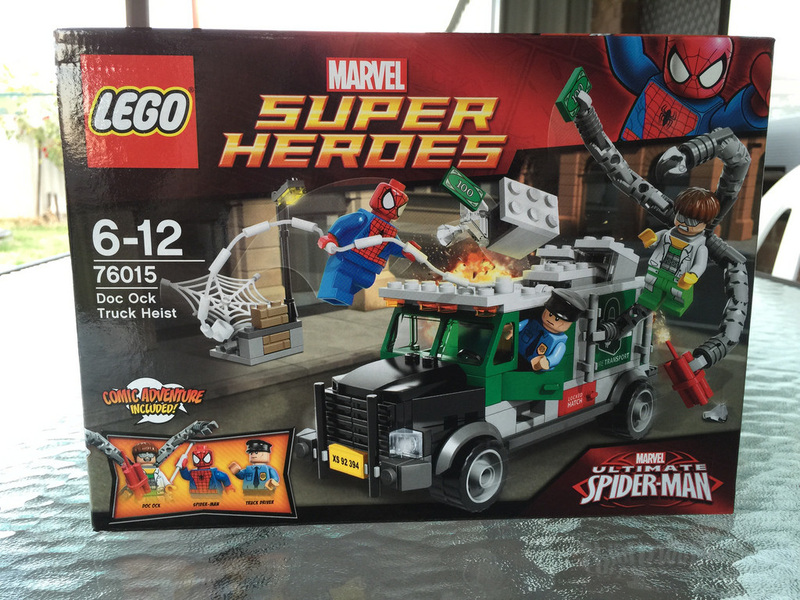 Other reasonably interesting parts include Spider-Man’s web and web line, Doc Ock’s tentacles, including the attachment part, and the 4 containers (actually mailboxes) with clear doors in the back of the truck that contain the money, diamond and gold ore. Aside from that, it’s a pretty standard set. 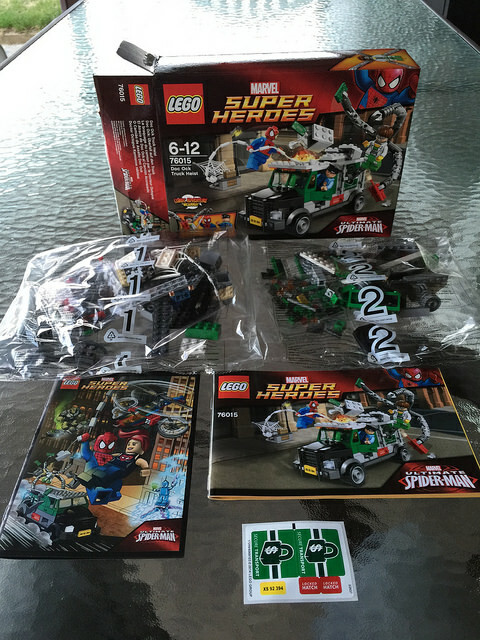 The minifigures in this set are quite neat, with Doc Ock being new to the set. Nothing too exciting again, but it is nice to have Spidey in my collection. The only other minifigure is the Truck Driver, who looks pretty standard. The minifigures have back printing. 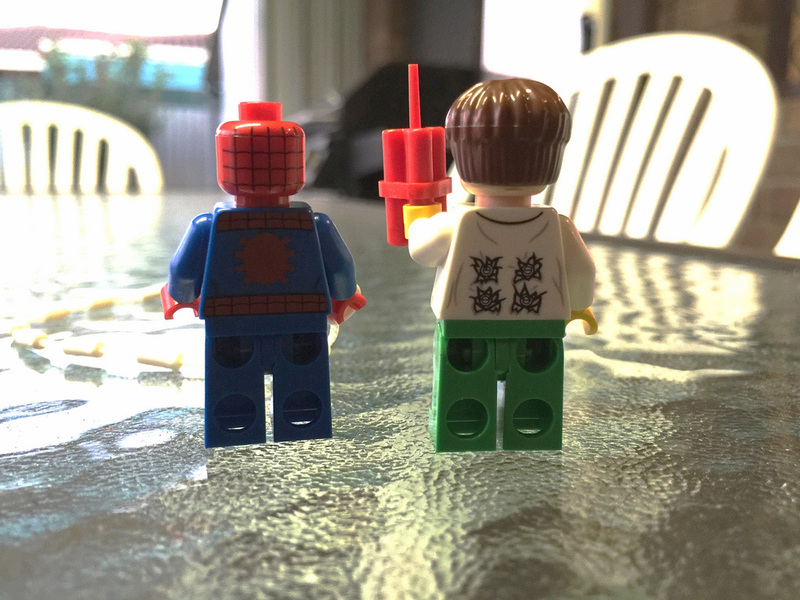 I especially like the back prints on Doc Ock. There’s the 4 holes for his tentacles. They’re covered up when they attach, but it’s a nice feature. 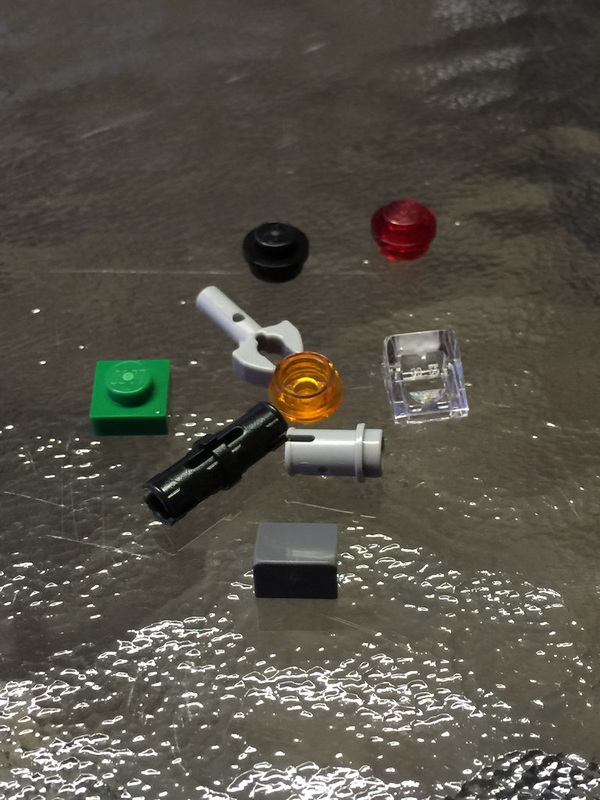 Pretty run of the mill spares this time, some 1×1 plates in round and square, a clear and a grey cheese block, Technic pin, and an extra claw connector. Again, it’s a pretty standard build. 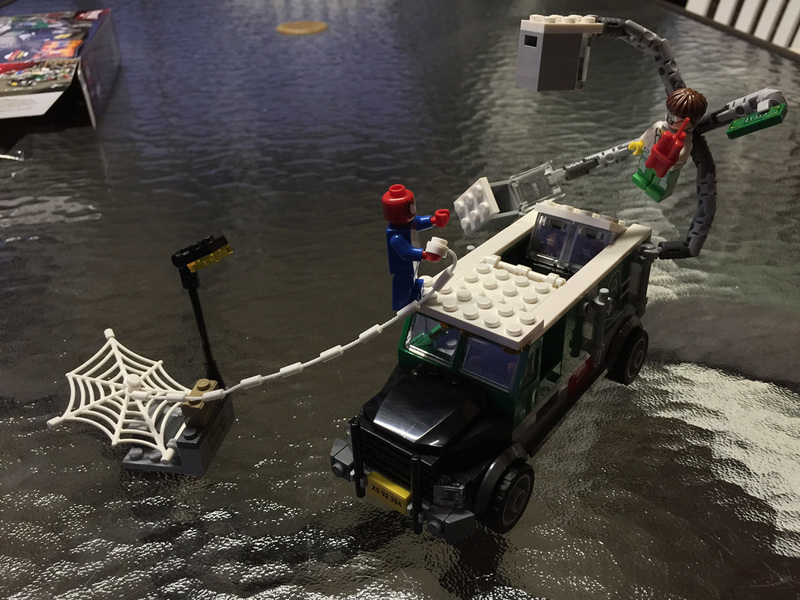 There’s a separate light post which attaches to the web and allows for a catapult type action. I’m not a big fan of these ones. Yes, it makes for interesting playability, but to me, that’s how pieces get lost. The web is able to be connected via a central stud, so it is still useful. The truck itself is quite an accurate depiction of an armoured car. There is a nice little hidden compartment on the very bottom of the truck, accessible via the red doors. I especially like the front of the truck, with the mean looking front grill. The back action is quite effective, as it looks like the back of the truck has been exploded by dynamite. All in all, it’s a pretty simple set, but would look good in a city scene. There are some nice minifigures, it has a good amount of playability, and comes with a few interesting pieces that can be used elsewhere. This one gets 7 out of 10 Spidey web-shots. Next review is 60034: Arctic Helicrane. Stay tuned and don’t forget to leave a comment below, and like us on Facebook!